Ernest Mtawali has been appointed as the new head coach of Malawi's national football team, with Burundian Nsanzurwimo Ramadhan named as his assistant. The Football Association of Malawi (FAM) president Walter Nyamilandu said Mtawali beat off competition from four other coaches in interviews held on Thursday. Both Mtawali and Ramadhan have signed a one year contract with the option of an extension. 51 year old Mtawali, a former Malawi midfielder, had been temporary coach of the team following the sacking of Young Chimodzi who was dismissed following the Flames' home defeat to Zimbabwe in their opening qualifying match in Group L for the 2017 Africa Cup of Nations. It will be the first time that Mtawali has taken charge of a national team at senior level having previously been Malawi's Under-20 coach. He believes his experience as a player and now coach is enough to see Malawi move forward. "It is a challenge that I have been looking for," Mtawali said following his appointment. "I think I am going to bring a different dimension to the national team using my previous successful career as a player. "We need to instil the tactical discipline in each and every player because what is important is to see Malawi achieving success." Nyamilandu told reporters Malawi are choosing a different option this time around. "The two coaches have not been tried and tested with The Flames and from what we have observed , they are different from the other breed of coaches that we have tried before in the sense that they are very innovative, very creative and also they are ready to take risks," said Nyamilandu. The FAM president said he hoped the two coaches would start the process of rebuilding Malawi so as to see the team go back to winning ways. "We have lost our style of play over the years and Ernest and Ramadhan represent that missing link. 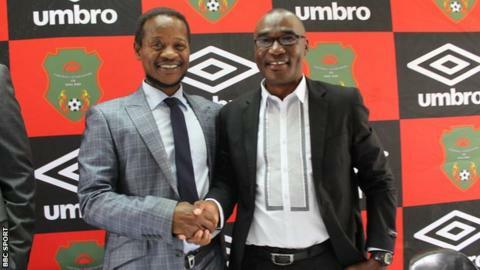 "They are both tactically minded because modern football is very scientific and we think they can bring in the high standard of play that we are lacking so that we can have the competitive edge" Nyamilandu added. Mtawali and Ramadhan's immediate challenges will be in the 2017 Nations Cup qualifiers. Malawi next play Swaziland early next month in their second group match before starting their World Cup campaign away to Tanzania in September.